A new interview from the Singapore Fashion Week! When Buro 24/7’s petite but powerful founder meets one of the greatest actresses and beauties of her generation, what else could transpire but a meeting of minds? 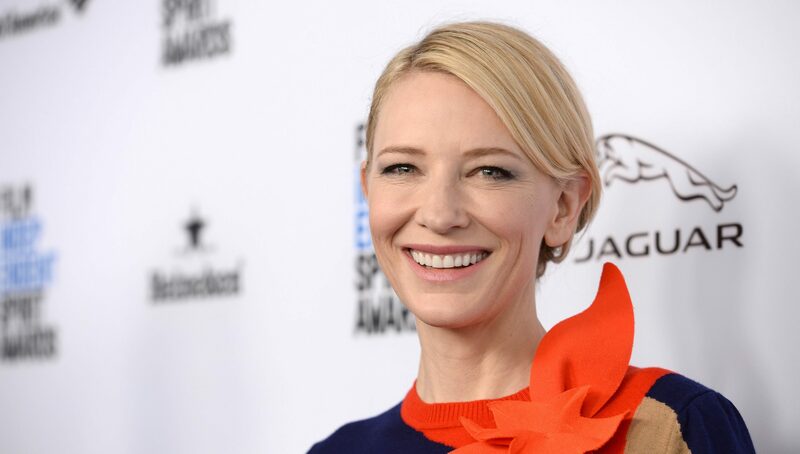 Blanchett was here to grace Singapore Fashion Week as an SK-II ambassador and jetted in and out within 24 hours to head to Cannes where her film, the Todd Haynes-directed Carol, reigned as one of the hottest tickets. Here, two of the most intriguing and admired women in the world, share a chat about beauty secrets, motherhood, and fighting for gender equality. Miroslava Duma: We’ll start off with beauty questions. How do you maintain your beautiful skin despite the constant travelling and extreme climate changes? Cate Blanchett: Everyone’s suffering from extreme climate change. You don’t have to be in the plane…I think it’s air-conditioning or artificial environments that we all find ourselves in. I come from Australia where the the sun is really harsh. I basically stay out of the sun and try to drink a lot of water. I used to decant the Facial Treatment Essence (FTE) and spray it maybe three to four times a day within air-conditioned environments or while I’m on set, both over makeup and also under makeup. But now SK-II has helped me as they’ve brought out this product called the Mid-Day Miracle Essence, so you simply spray it on. Because the skin is the largest organ in the body, you’ve got to drink water…you’ve got to feed your skin. MD: Do you drink a lot of water? Does it help? For me I get a bit bloated when I drink too much water. CB: Yes I do, but you can drink too much water. You’ve got to find a happy medium. With this product you also can spray it on top of makeup. Because often people will spend all this money on skincare and then they’ll put makeup on top of it and it sort of ruins the effect. I use SK-II Foundation which has pitera in it, so you’re actually moisturising your skin with a liquid foundation and then I spray the FTE on top. It seals it in. MD: What are some of the best beauty secrets you’ve picked up? CB: I think I’ve gotten better at putting makeup on by working with great makeup artists. It’s finding the right shade of concealer or makeup, but in the end it’s all about diet and skincare. So I’m more obsessed with skincare than I am with makeup because I find that if I use good skincare — which I have been using for a long time — you don’t really have to use as much foundation. MD: I wanted to ask you about kids because I know you have four. I just recently had a second baby, a girl four months ago. MD: I was in Australia recently and honestly felt that they [Australians] were the best people in the world, and it was the best country in the world. You know I often associate people with animals. We visited the zoo and when I saw the kangaroos — maybe because I travel so much and try to do everything all at once — I thought it would be nice to be a kangaroo in my next life so I can carry my kids with me. CB: Until they’re ready to come out and go with you? But you carry them here(points to heart) and you carry them here (points to her head). MD: But as a very successful person and mother of four, how do you manage? CB: It’s all about partnership. I’m lucky that my life partner is also my work partner and we work together and raise children together. We tag team. I think it’s harder for women when they don’t have supportive partners. And still women get asked how we find that balance, men don’t get asked that question. Child rearing is still seen to be solely a female activity. And I love it. You know it changed my outlook and it changed my life. I didn’t grow up as a girl with big dreams to have babies, but when I did it made me more aware about the roles I choose to play. MD: It’s important for a great woman to have a great man behind them to help them develop. Like in the case of Margaret Thatcher. CB: But that’s the thing about equality, you want to work alongside people. So no one’s behind me…I work alongside people. Hopefully one day we will get there. It’s 2015 and we’re still talking about inequality. MD: Do you identify as a feminist? CB: Yeah. Unfortunately we’re in 2015 and women still do not receive equal pay for equal work. I don’t quite know why. Domestic violence is on the increase. There are 27 countries around the world where women can’t confer their nationality upon their children. That’s why I think it’s important for women to identify as being a feminist because I think we’ve lost a lot of ground. MD: What is a feminist to you today? CB: I think it has to do with choice. I think it has to do with equality. There was a point that feminism was a dirty word, because it was somehow considered to be threatening or denigrating to men. But equality benefits everybody and to me that’s what it’s all about. MD: Today it’s equality, exactly. Do you ever still feel vulnerable in front of the camera or in front of a big audience? CB: I always try to look out, rather than think about it if I’m feeling nervous. It’s an exciting tightrope walk being on stage. But yes, it always feels like the first day of school. I think how am I going to do this? I don’t know the process and I don’t know where to start. But then you do it with other people so it takes some of the pressure off. MD: You support charities like Solar Aid. How do you choose the causes you support? CB: There’s a whole suite of individuals who need support. 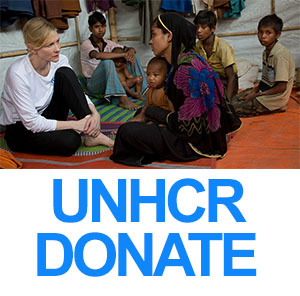 Something that affects us all is global poverty — it’s the issue of refugees which is a global problem. The issue of 10 million stateless people around the world. It’s an economic problem as well as a social problem and a moral issue. Since I’ve become a parent, I’ve felt it’s even more important and the lack of political will is very frustrating. Poverty is an essential problem that everybody faces. MD: It’s amazing what you’re doing. CB: I don’t think it’s amazing… there are a lot of people doing a lot more than what I’m doing. MD: Well that’s my opinion! Especially because you have this power of influence. A lot of young women look up to you and you’re setting an example. So they don’t just want to look beautiful, they want to do good things. And I think that’s what you represent. CB: Women are complex, evolved, diverse human beings. And there’s many women trying to progress things forward in their small sphere, so if I’m doing something small that’s great. There’s a lot of women doing things… you included, it’s fantastic! MD: Thank you. My last question is, if you had a choice, would you rather be a woman or a man? CB: I’m a middle-class white girl who has grown up in relative privilege, so I’ve had the option to not think about my gender. But there’s millions of women the world over who bemoan the fact that they’re women every day. They can’t get educated, they can’t get a job or can’t vote or they’re sexually enslaved or they can’t even ride a bicycle. And it’s not just in the Middle East, I think it’s also in developed countries where it’s difficult for a woman to re-enter the workforce. It behooves men for women to be equal. It’s an economic advantage for everyone. I love being female, but I have the privilege to say that. MD: We’re very lucky. Thank you very much Cate.